Manually operated by turning a quarter turn or by pulling a cable. You must drain the tanks yourself at the end of each day of driving. See Figure 5.1. Automatic–the water and oil are automatically expelled. These tanks may be equipped for manual draining as well. You put on the brakes by pushing down the brake pedal. (It is also called the foot valve or treadle valve.) Pushing the pedal down harder applies more air pressure. 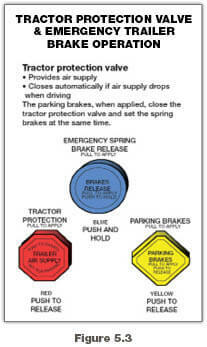 Letting up on the brake pedal reduces the air pressure and releases the brakes. 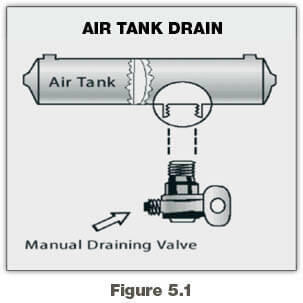 Releasing the brakes lets some compressed air go out of the system, so the air pressure in the tanks is reduced. It must be made up by the air compressor. Pressing and releasing the pedal unnecessarily can let air out faster than the compressor can replace it. If the pressure gets too low, the brakes won’t work. S-cam Brakes. When you push the brake pedal, air is let into each brake chamber. Air pressure pushes the rod out, moving the slack adjuster, thus twisting the brake camshaft. This turns the s-cam (so called because it is shaped like the letter “S”). The s-cam forces the brake shoes away from one another and presses them against the inside of the brake drum. 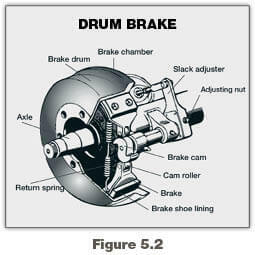 When you release the brake pedal, the s-cam rotates back and a spring pulls the brake shoes away from the drum, letting the wheels roll freely again. See Figure 5.2. Another type of warning is the “wig wag.” This device drops a mechanical arm into your view when the pressure in the system drops below 60 psi. An automatic wig wag will rise out of your view when the pressure in the system goes above 60 psi. The manual reset type must be placed in the “out of view” position manually. It will not stay in place until the pressure in the system is above 60 psi. Vehicles with ABS have yellow malfunction lamps to tell you if something isn’t working. On newer vehicles, the malfunction lamp comes on at start-up for a bulb check, and then goes out quickly. On older systems, the lamp could stay on until you are driving over five mph.